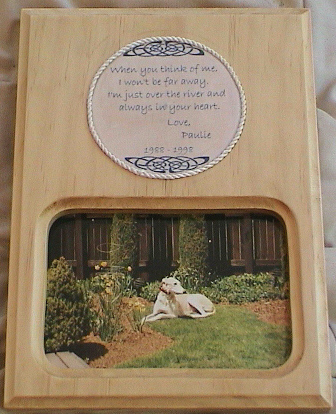 Wooden memorial plaque -10 x 7 clear pine with photo area (4x6) and message with your dog's name and dates. Use may use either the crossing message or the Rainbow Bridge message. 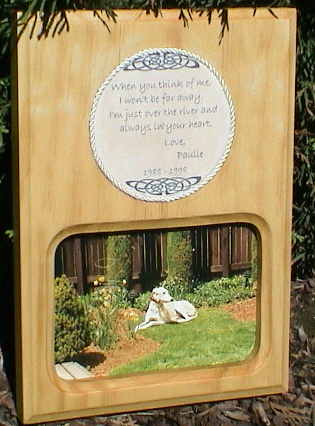 If you would like a custom message please contact us. Comes ready to hang on your favorite wall. When you think of me, I won't be far away. I'm just over the river, and always in your heart. where the sun is warm and the grass is luscious emerald green. There I will romp and play until that special day, I see you in the distance. Our hearts will fill with joy as we finally meet again. Then we will cross the Rainbow Bridge together. Back to Dog Stuff .